The goal of making a lemon battery is turning chemical energy into electrical energy, creating enough electricity to power a small LED light or a watch. You can also use limes, oranges, potatoes or other acidic foods. This experiment can be educational for children, with adult supervision. Alessandro Volta is credited with making the first electrochemical cell battery in 1799, using a stack of alternating copper and zinc discs, with cloth soaked in salt water between each disc. The unit of electromotive force was named "volt" in his honor. One lemon will work, but using more will produce more electricity. Six is a good number. The battery also needs two different types of metal. Pennies and paper clips are well-suited to this experiment, as the copper in the penny and the zinc or steel in the paper clip will create a positive and negative flow of electrons once inserted into the lemons. Rolling the lemons on a hard surface is a good way to break up the fruit inside and get the acidic juices flowing more easily. Use a knife to make two small slits, and insert one penny and one paperclip into each lemon. Using seven alligator clips, which are available at hardware and electronic stores, connect the penny of one lemon to the paperclip of the next lemon, and continue connecting all of the lemons in this way. There will be one lemon with a paperclip, and one lemon with a penny that are not connected to the rest, which will be the leads. Bend apart the legs of the LED light, and use alligator clips to connect the paperclip lead to the shorter leg of the LED, and connect the penny lead to the other leg. The LED should light. The two different metals, used as electrodes, are placed in the lemon, which can conduct electricity because it contains acid, an electrolyte. One metal collects an excess of electrons, while the other metal loses electrons. This positive and negative flow between the electrodes creates the electric charge. 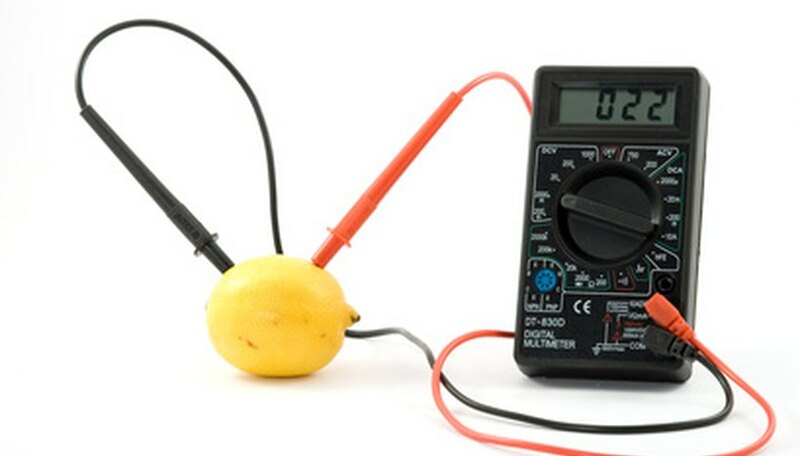 A voltmeter can be used to test the voltage of the lemon battery by simply connecting the leads. You can also try breaking up the lemons by rolling them around more. Be sure the penny and the paperclip on each lemon are not touching each other. The charge will not be enough to power larger light bulbs and more complex electronics because the fruit produces a very small current--about one milliamp per lemon, or 7/10 of a volt. Patrick, Taylor. "Lemon Battery Facts." Sciencing, https://sciencing.com/lemon-battery-6327161.html. 24 April 2017.